The easy answer is “YES get a full set” but that’s not always the correct one. In fact, if I had to rebuild my entire shop from the ground up and retool it, I’d probably avoid an entire set of chisels and instead concentrate on adding one or two high quality versions as needed. 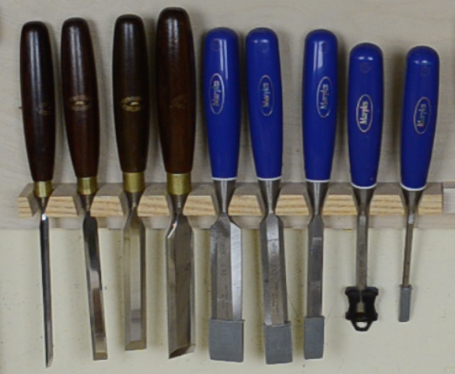 Most of these chisels never get used! In today’s episode I share with you the advice I like to offer new woodworkers (and some experienced ones) when it comes to purchasing chisels. With so many different tool manufacturers, sizes and even specialty chisels to choose from, it’s hard to decide where to get started when buying your first (or next) chisel(s). My advice is pretty simple, and it can easily transfer to other tools and accessories in your shop later down the road. Nice talk on chisels Matt. I agree, buy the best quality you can afford and only what you need for the project in front of you. Add more as you need them. Try very hard to resist the urge to have that beautiful full set that will look so cool in your cabinet. Even with the typical price break gained by purchasing a full set you will still spend more money than you will if you buy them as you need them. At least 30% of those in a full set will never really be needed. I have a full set of Marpels (11). Decent quality and they look great, but I only use half of them at most. And if you are looking at Lie-Nielsen quality that’s a lot of cash.